Valley Parade or Northern Commercials Stadium (Previously Coral Windows Stadium) for sponsorship purposes, is the home ground of Bradford City FC. Dating as far back as 1886, the 25,136 capacity ground mostly sees League One football matches, but also occasionally Rugby matches. 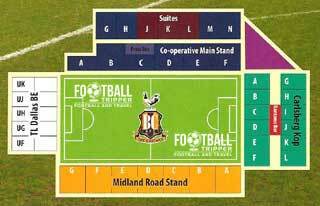 Although the club were only founded in 1903, Valley Parade has been the spiritual home of Bradford City since 1886. 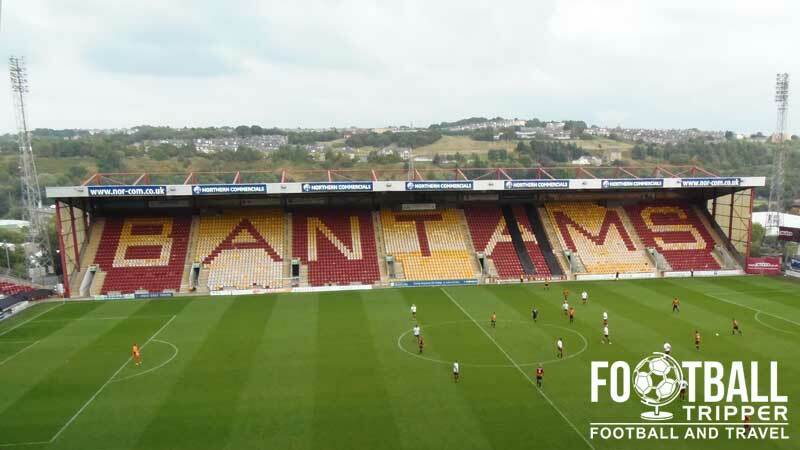 The Bantams were formed in 1903 after Manningham F.C switched codes, and converted from Rugby to Association Football at the start of the 20th century. Previously the site of a quarry, the name Valley Parade is derived from the fact that there is a steep hillside adjacent to Manningham. The original ground consisted of a single 2,000 capacity stand which contained the players’ dressing rooms within, and the inaugural fixture was played against Sheffield United’s 1903 FA Cup Winning Side in a bid to promote football in the local area. After the Bantams gained membership to the Football League the capacity of the ground greatly increased with Achibald Leitch’s designs accommodating up to 40,000 fans by the 1908-1909 season. With a large capacity, the ground would remain unchanged until 1952 when the Midland Road Stand was rebuilt and a number of minor renovations took place such as the addition of floodlights. The most significant moment in the stadium’s history came during the last game of the season on 11th May 1985 when a fire broke out within the main stand. Comprised mostly of wood, the stand burnt down in just nine minutes and tragically 56 fans died with just under 300 were injured as a result of the disaster. Bradford temporarily relocated to Elland Road and Huddersfield’s Stadium whilst restoration work was carried out, and new stadium safety legalisation was quickly introduced to combat the threat of similar stadium fires. 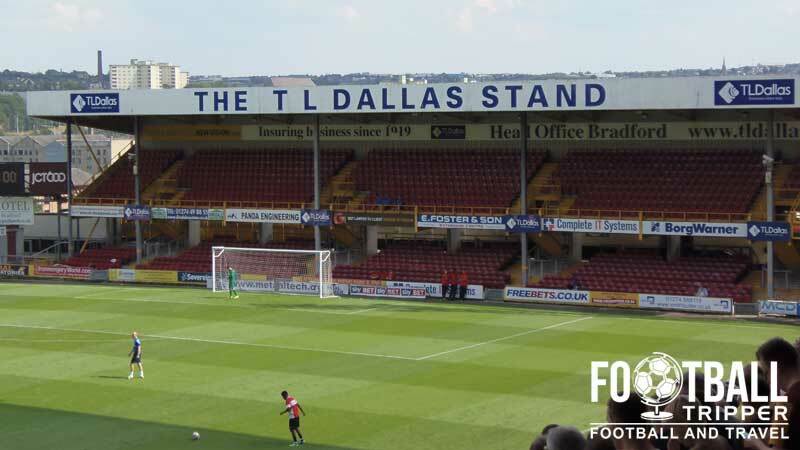 It wasn’t until the late 1990s and early 2000s that Valley Parade was able to re-imagine itself through redesign and renovation, however for those in attendance the memories and emotional scars will forever remain. There are four stands at the stadium: Carlsberg Kop (North), Midland Road (East), TI Dallas BE (South) and the Co-Operative main stand (West). Away fans are housed in the southernmost goal-end, known as the TL Dallas Stand for presumably reasons of sponsorship. Capable of accommodating an estimated 1,840 supporters, this section of the ground forms one of the two the smaller, unconnected stands, and is largely dwarfed by the much larger Co-operative and Kop parts of Valley Parade. The south stand is configured over two-tiers with many fans believing that a better view is obtained in the second tier, although this comes with a slight caveat in that views could be partially restricted by the roof support beams depending on where you are sat. 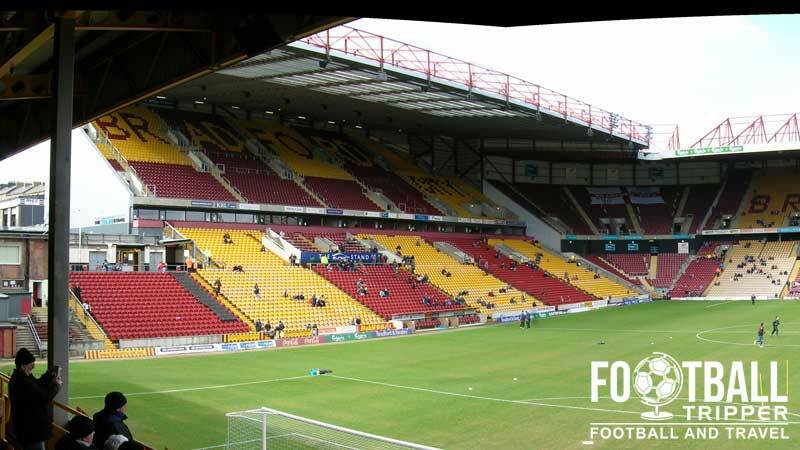 Rated as an enjoyable day out, Valley Parade is said to inherent its name partially from the bottom of the valley it is located within and this means that fans are often greeted with a cold prevailing wind in the exposed southern and eastern stands. As a University city rest assured that there are plenty of reasonably priced boozers within the center of town, and as Bradford’s stadium is less than 15 minutes walk away football fans face an abundance of choice, not including the opportunity to have a pint at the ground itself. The three most popular pubs with both home and away fans are usually the old traditional ale houses, with three options awaiting you: The Sparrow, The New Beehive Inn and Haigys Public House all of which represent the smallest of detours on-route to Valley Parade. Besides a wealth of the generic fast-food options with the city centre such as McDonalds, Subway and KFC there are also numerous independent purveys of lard who are conveniently located along the A650 Manor Road which leads to the stadium. As well as a Tesco Express on this road there is the likes of Pizza Milano, Manningham Fisheries and Al Mu’Min Grill House. Familiar faces such as pies, sausage rolls and burgers will also greet you at the ground. The club shop is located at the stadium on South Parade in between the Co-operative main stand and the T.L Dallas Stand although these sponsorship names may well be out of date! The club’s official online store is known as the Bantams Club Shop: www.bantams-clubshop.co.uk. The club shop or as it should be known…The Bantam’s Merchant. Both are open for 30 minutes after the final whistle. 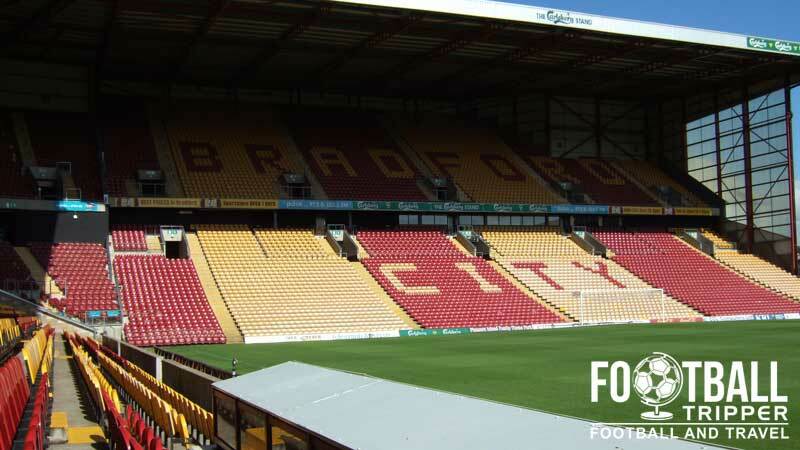 It doesn’t appear as if Bradford currently offer fans the chance to undertake a stadium tour of Valley Parade. If this changes, we’ll be sure to update this section. You can buy Bantam tickets via the typical channels such as phone (0871 978 8000), email, [email protected] in person at the stadium’s ticket office (open weekdays 9.00 am – 5.00 pm) and most commonly on the internet using the club’s online ticketing system. The Coral Windows Stadium is located approximately 0.7 miles north of Bradford city centre, parallel to the railway line which runs to the east of the stadium. The Valley as seen from the nearby railway station. The closest railway station is Bradford Forster Square which is just under 1 mile from Coral Windows Stadium, with the Bradford Interchange station around half a mile or so further south. Both First Bradford and Keighly operate frequent bus services around the area of Bradford. For the full range of bus times and routes to Valley Parade please visit the respective websites. Coral Windows Stadium, Valley Parade, Bradford, West Yorkshire, BD8 7DY. Bradford FC advise fans that there are no available parking facilities at the stadium on matchdays with very limited street parking to boot. Fans are instead encouraged to find another public car park in the city centre and walk the remaining distance to the stadium. There are a equal number of hotel choices in Bradford both north and south of The Valley Parade with the Hotel Ibis towards the north-east on Canal Road probably the closest. Towards the city centre where the two train stations are to the east of the University campus there is the popular Jurys Inn Hotel, the imaginatively named Bradford Hotel and a reliable old Central Premier Inn.